She'yaa Bin Abraham-Joseph, a U.K. national, has been facing deportation since he was detained by Immigration and Customs Enforcement in Atlanta last Sunday. The Grammy-nominated rapper was granted release on bond Tuesday, according to a statement from his representatives Charles Kuck, Dina LaPolt and Alex Spiro. "In the last 24 hours, in the wake of the Grammy Awards at which he was scheduled to attend and perform, we received notice that She'yaa was granted an expedited hearing," the statement said. 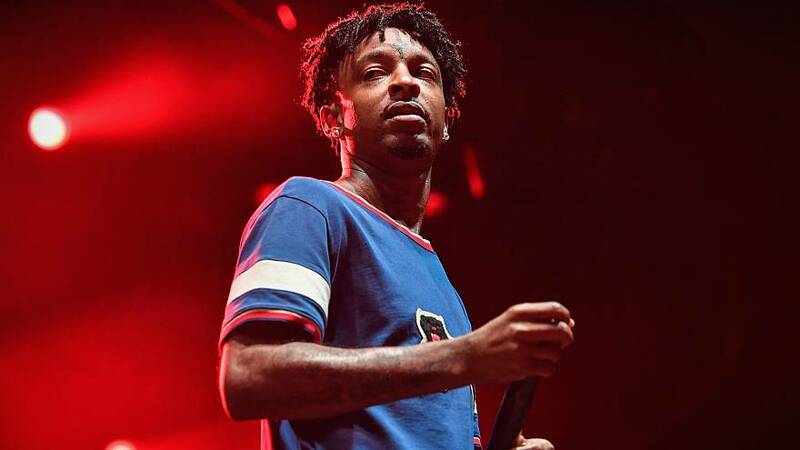 "Today, 21 Savage was granted a release on bond. He won his freedom." The attorneys said they had been working for the past nine days with ICE to clarify Abraham-Joseph's legal standing, determine his eligibility for bond and "provide evidence of his extraordinary contributions to his community and society." Abraham-Joseph, 26, still faces deportation and potentially a ban of at least 10 years against his returning to the U.S., according to immigration attorneys. His legal team has said in previous statements that Abraham-Joseph arrived legally in the U.S. at the age of 7 and remained in the country until 2005 when he left for a one-month visit back to the United Kingdom. He then returned to the U.S. under an H-4 visa in July of 2005 and his legal status expired in 2006. "Mr. Abraham-Joseph, like almost two million of his immigrant child peers, was left without immigration status as a young child with no way to fix his immigration status," his lawyers said. ICE said in a statement following Abraham-Joseph's arrest that the rapper was arrested "during a targeted operation" in the metropolitan Atlanta area and placed in removal proceedings before federal immigration courts. That conviction record was expunged last year and sealed as part of the state's first-offender program, attorney Jacoby Hudson, who represented the rapper, told The New York Times. A spokesperson for the Fulton County District Attorney's Office confirmed to NBC News that in accordance with Georgia's first-offender code, the case was "sealed and we cannot confirm or deny any information about the disposition of the matter." Abraham-Joseph had been nominated for two awards at Sunday's Grammy Awards, including record of the year for the song "Rockstar." The rapper said through his legal team that while he was unable to attend the event, "he was there in spirit and is grateful for the support from around the world and is more than ever, ready to be with his loved ones and continue making music that brings people together." "He will not forget this ordeal or any of the other fathers, sons, family members, and faceless people, he was locked up with or that remain unjustly incarcerated across the country," the statement said. "And he asks for your hearts and minds to be with them." In June, Reuters reported that while in previous years ICE would have released many immigrants facing deportation that had little or no criminal history on bond, the agency has since been denying bond for many immigrants, pushing to keep them in detention for the duration of their cases. ICE declined to respond to claims it was more unwilling to provide bond under the Trump administration, saying such decisions were made on a case-by-case basis.